WASHINGTON – Republican Sen. John McCain has returned home to Arizona after being hospitalized for a viral infection while battling brain cancer and will miss a crucial Senate vote on the GOP tax package, his office said Sunday. The 81-year-old senator will undergo physical therapy and rehabilitation at the Mayo Clinic in the state after spending several days at Walter Reed National Military Medical Center in Maryland. In a brief statement, the office provided an assessment from Dr. Mark Gilbert, chief of neuro-oncology at the National Institutes of Health’s National Cancer Institute. Now in his sixth Senate term, McCain underwent surgery in mid-July to remove a 2-inch blood clot in his brain after being diagnosed with glioblastoma. Earlier in the day, President Donald Trump told reporters he had spoken to McCain’s wife, Cindy. Republicans hold a slim 52-48 majority in the Senate, and McCain and Sen. Thad Cochran, R-Miss., missed votes last week. The 80-year-old Cochran had a non-melanoma lesion removed from his nose earlier this week. He is expected to vote on the tax bill. In a dramatic turn, he cast a deciding vote against the Republican health care bill – a move that drew the wrath of Trump and conservatives. McCain’s vote scuttled the seven-year effort by the GOP to dismantle much of President Barack Obama’s health care law. But McCain’s condition has appeared to worsen in recent weeks. He suffered a minor tear in his right Achilles tendon, forcing him to wear a walking brace. 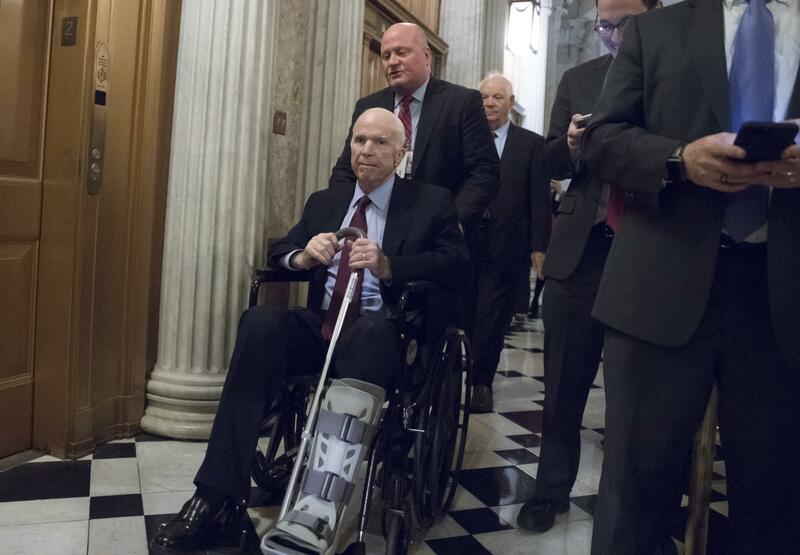 McCain eventually began using a wheelchair, with members of his staff pushing him where he needed to go. Published: Dec. 17, 2017, 2:48 p.m. Updated: Dec. 17, 2017, 9:27 p.m.